In anticipation of his presentation at eMetrics Summit in New York City, October 23-27, 2016, we asked Damion Brown, Principal Consultant at Data Runs Deep, a few questions about digital marketing analytics. 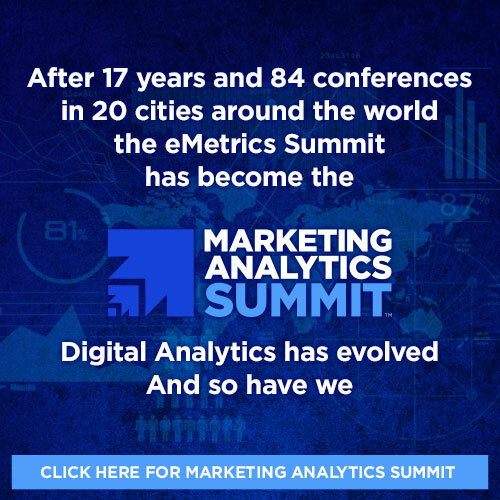 Check out Damion’s interview in relation to his eMetrics Summit presentation entitled, Getting Closer To Content With Advanced Analytics. Damion: We had some guys that were creating a load of How To content on their website, and based on page views month-to-month they thought that nobody was really reading what they were putting up. They’d looked at their conversion rates and didn’t see much to get excited about, but it was only when we sat them down and looked at how users behaved in subsequent sessions after reading the How To stuff, there was a dramatic uplift : thirty something percent more likely to convert if you read instructional content in an earlier session. Nobody expected it, but they’re acting on it; How To content is about to become front and center of their messaging. Sometimes you can find gold in the unlikeliest of places. Damion: Attribution. There was a post on Reddit a few months ago that asked the question, “what’s a secret about your industry that the general public doesn’t know about?” One of the top answers was, “in digital advertising, nobody really knows what works even though everyone says they do.” It’s kind of a flippant comment, but there’s an unfortunate truth at its heart, I think. Damion: It’s rare to see an implementation without some kind of error in there somewhere, but over and above this the one thing I guess is common to a lot of organizations is that they’re not asking the right questions about data. Still. It’s too many open-ended questions like “what loyalty overlap do I have?” instead of targeted questions like “what’s our loyalty among users that are engaged on Facebook and EDM?” It’s essentially the same question, but I know which of the two sets of phrasing is going to yield more insight. Damion: It’s probably a cliché to say Avinash Kaushik, isn’t it? A bit like saying your favorite movie is Casablanca or your favorite album is Pet Sounds. Actually that’s pretty funny: Avinash is the Pet Sounds of analytics, and I bet he could probably put together a pretty awesome blog post themed around that album. I Know There’s An Answer would be a pertinent title! Simo Ahava is unmissable too, of course, and recently Paul Koks’ blog online-metrics.com has been producing really quality stuff. Damion: Our new website is a hair’s breadth away, and we’ve been working with some wonderful people to get cartoony deep-sea creatures, buried treasure, a yellow submarine and a bundle of other stuff to flirt with the Data Runs Deep idea. The way you present your work isn’t as important as the work itself, of course, but we want to emphasize the idea that data is fun, that learning is fun, that trying new things is fun…. it’s all fun, and if you’re not having fun doing it then you’re probably not doing it right. Damion: I’m going to be talking about effective analytics for content websites. This wonderful world of analytics can sometimes sound like a conversion rate echo chamber, and for websites that aren’t selling anything this can become a little alienating. I’m going to be talking about how digital analytics can be just as effective in measuring engagement, satisfaction, frustration, and loyalty on websites that can’t measure success in dollars and cents. And there might be a Pet Sounds reference or two as well! Don’t miss Damion’s presentation, Getting Closer To Content With Advanced Analytics at eMetrics Summit in New York City, October 23-27, 2016. Click here to register for attendance.